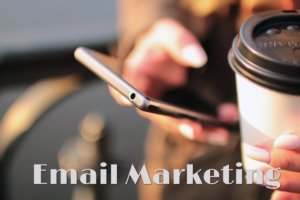 Are you employing email marketing in your tools? I was very diligent about sending out my email marketing, twice a month. Then, I got a gig with a customer that is a majority of my billable hours. I fell off sending out my email newsletters for about a year and a half. It came time to renew the annual subscription and I was thinking hard about whether I needed to pay out that money when I wasn’t using the service. I decided it is better to have it and not use it, because when I do need it, it will be there. When I went back in to the system there were a number of challenges that I faced. Couldn’t pay on-line because my password had expired, had too many contacts for the subscription that I had, and the people in my list were probably not going to want to receive my emails. When I went into my connections, I had 500+ that were bots that had signed up for my emails. I cleaned out as many as I could find of those 500+ email addresses before I could send an email out to my real subscribers to see who still wanted communication from me. In the process, I spoke with my Email Marketing Services provider and discovered how to add the “I’m not a robot” confirmation and to add a approve my subscription by email option – or opt-in. This should cut down on the unwanted subscribers. Sending the email also allowed me to check the bad email addresses and allow people to unsubscribe. That way when someone sees my email, I know that they want to see it!! Another tip you might try is using the automated options for sending emails to new customers or those who sign up for your email marketing newsletters. Need more information about using this? Drop me a line. 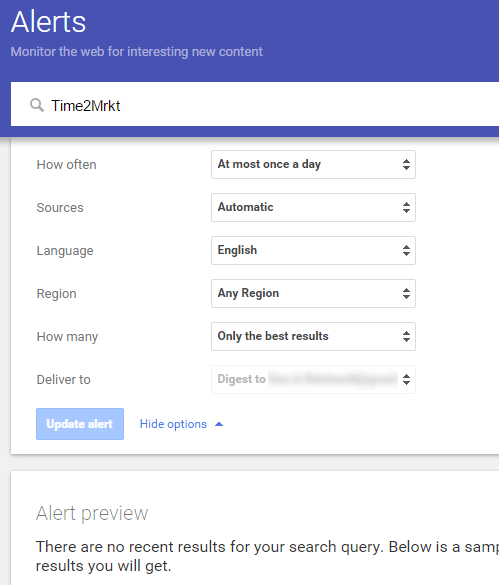 How can Google Alerts help your marketing? Press release – Include the words in the title to see where it was published. Job Search – Read this article from Careerealism about How To Use Google Alerts for your search. Frequency – can be as it happens, once a day, or once a week. Sources – automatic (all of these), news, blogs, web, video, books, discussion, or finance. Region – any, or a specific county. It doesn’t allow more specific than that. 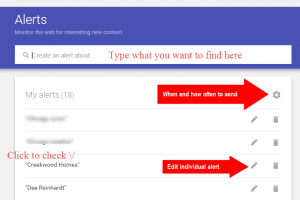 Where to deliver the alert – I would suggest a gmail address. Once you pick what you want to track, you can establish how frequently you get the updates. 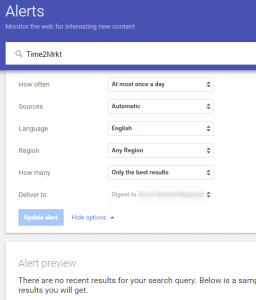 If you would like to use the information in the Google Alerts to help you with content for your social posts, set your delivery time for early in the day. 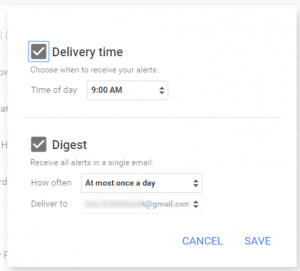 If you choose the digest option, all of your alerts will come to you in one email. 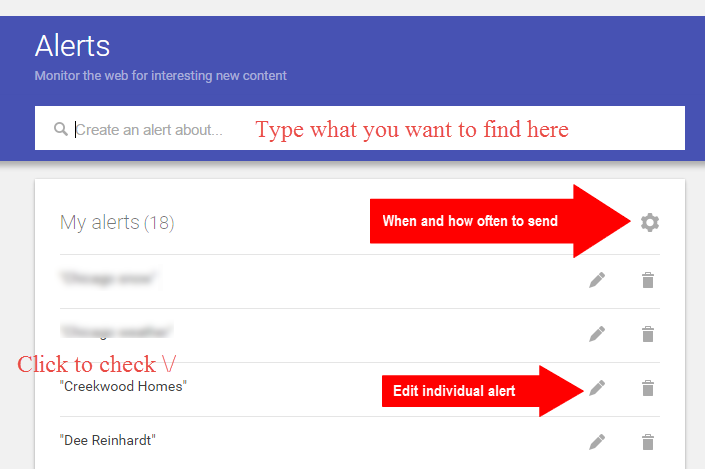 I have alerts set for some of my clients, so I personally prefer to have my alerts come as individual emails. Hopefully, you have picked great keywords to help you find information that you can share. 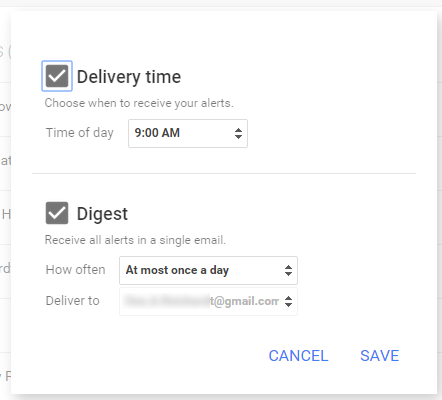 Use Google Alerts to help you stay up to date on new information in your industry and to help you fill out your content marketing. Ads that people pay for to increase their visibility. 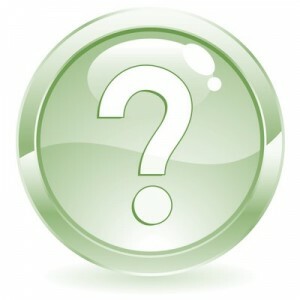 They use a process called pay-per-click or PPC to drive traffic to their website. Most businesses opt for this paid search system, as it means they only have to pay for their ad every time someone clicks on it. Organic results based upon how the website has set-up their back-end data, in-bound links and how people have searched in the past. A great article that I just read includes 60 tools to help you find keywords for your website. If you have a website, I encourage you to check out the list and try a few of the tools. Using a PPC approach could become costly. Unless you can track your lead source, you may be spending money without results. Organic results can be improved by social media engagement. We can talk more about this option if you would like to improve your presence. Both of these opportunities are fine for people with business website. What I would like to discuss now is how do you find the keywords to represent you, especially if you are in job search mode. When I teach LinkedIn sessions either in a class or one-on-one, I recommend using keywords in your personal profile. My suggestion would be to use a word cloud tool. 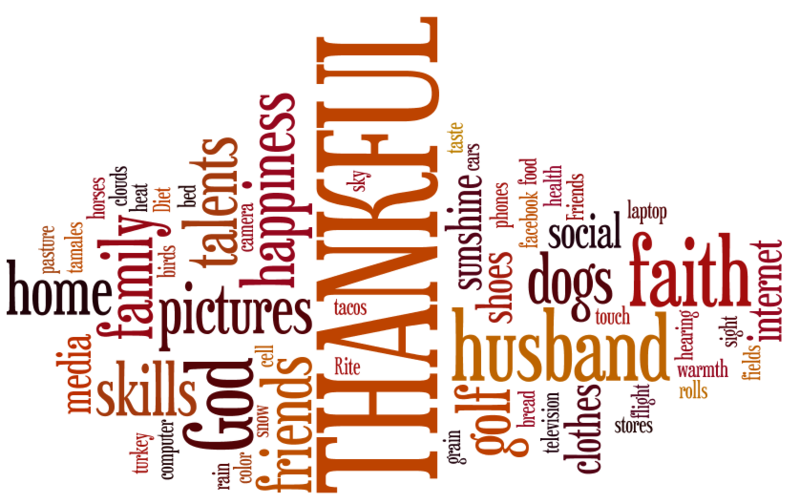 A word cloud as shown to the right is a grouping of words into a shape or a random shape that highlight the most important words. I used this particular one in an article on Thankfulness I wrote around Thanksgiving a few years ago. This tool could be very useful for a job seeker to find the keywords that they need to include in their resume or in their LinkedIn profile. 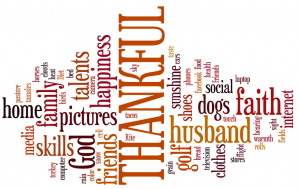 Take a look at this article to see a few of the options that you can use to create a word cloud. I have used a couple of them, but I think Wordle.net might be the most versatile. Watch the video below to see how you can combine several job descriptions into one word cloud to find the keywords you should be using in your resume and on your LinkedIn profile. So often someone posts something that they think is harmless. But in reality, it could potentially cause the biggest faux pas of a companies life. Recently an article got me thinking about how you must be judicious in what you say on-line, how you say it, and to whom, because what you say will always be there. 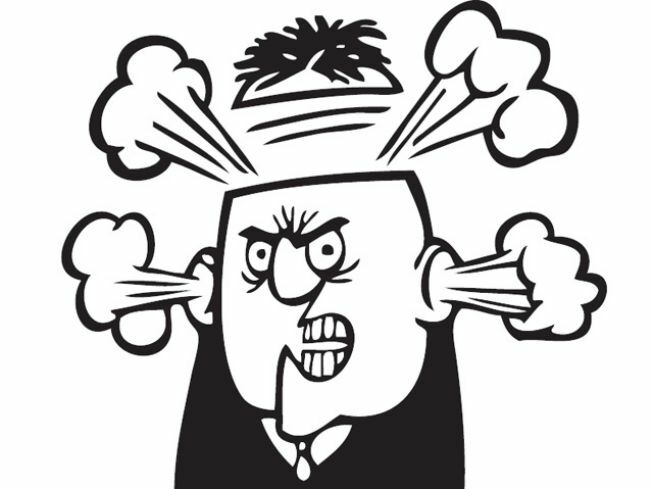 Early in my days of participating in an on-line forum, I discovered that having a “battle of words” with another person is fruitless. No one wins. AND that discussion could stay there indefinitely. As business owners we want to avoid that potential at all costs. Remember the commercial that says “What you do in Vegas, stays in Vegas”? Well that isn’t the case on social media. It has staying power. Yes you can delete posts that you make, but someone somewhere could retrieve that and it may come back to haunt you. This is why is ultimately important that the person managing your social media has a firm understanding of your brand and it’s image. Whatever is posted needs to be on point/mission always. Planning helps solve that issue, but you can’t always plan for outside injections of comments. When someone posts on your page or a review site, it is important to respond in a positive way to help resolve an issue as rapidly as possible. Taking down a negative comment doesn’t show people that you wish to resolve issues. In some cases, if you have a very loyal fan base, they will take care of the negative comments for you by offering up an alternative point of view or flat out defense of you as a business. Just don’t let an issue languish thinking that it will be forgotten. In my former life in retail (before the internet), one of the training programs said – a pleased customer will tell 2 people, an unhappy customer will tell 10. With 24/7 connectivity over the internet and social media, that unhappy customer could tell 10’s of thousands or millions before you have had your morning coffee.